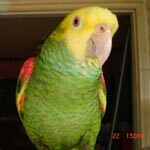 Parrot Forum • View topic - Should I leave food in cage? Should I leave food in cage? Hi everyone, I'm a complete newbie to bird ownership and have just a couple of days ago purchased a pair of Lovebirds. When I brought them home initially i tried to feed them fruit and green leaf vegetables and they did not take to either. When later in the day I bought some seed they dived into it and have not stopped eating since. Also on the initial day (pre seeds) they were friendly and happy to sit on my hand but in the days since they have become less and less willing to do so. So my question is this: Now that I know what they eat, do I deprive them of it by not having it readily available in the cage so as to encourage them to be more sociable and more likely to eat from my hand? I imagine this could work but is there a better way to encourage them to be more sociable? Re: Should I leave food in cage? As for getting them to be more sociable, I'd try to have strictly non-physical interactions with them for the first few days/weeks, gradually working toward building a bond with them. Sitting near them, talking to them, just proving that you're somebody that they want to trust enough to let you touch them. My macaw I got a week ago did the same thing to me, letting me touch her and stepping up to me on day one, then being extremely hesitant afterward. Not sure what that's about, but I do know with my budgie, before I built a bond of trust with him, he would step up, but only after a lot of coaxing and effort. When I realized it was just something he didn't want to do, I spent the next 3 weeks sitting next to him, hand resting on his cage to desensitize him to my hand, and talking to him a lot. Now we're are the best of buds and still getting better every day. As for getting them to eat better foods like veggies, I'm unfortunately no help there, because I can't get my budgie or my macaw to eat veggies yet. Definitely going to keep trying new things though. Geez, no, you can't deprive a bird of food! They have very high metabolisms and need to eat A LOT, especially when they are young which I assume your birds to be if you just got them from a store or a breeder. And you can't free-feed them any kind of protein food [seeds, pellets, nutriberries, etc]. They need to eat cooked whole grain mixed with chopped veggies, a leafy green and a piece of fruit for breakfast and a budgie seed mix for dinner. This is not only much healthier for them but it will also allow you to tame them and train them because they will be eager for the seed or little piece of nut you can use as reward for training. But you need to tame them first and before you tame them, you need to make them trust you and this is where the advice given above comes in handy. You need to keep them at a solar schedule with exposure to dawn and dusk and you can't free-feed protein because, otherwise, they would be hormonal all the time and hormonal birds cannot be tamed or trained [they bite]. Now, lovies are great eaters of fruit and greens - not so much of veggies but they do love corn on the cob, grape tomato, celery, peas, etc. The thing with lovies is that they are hardly ever handfed and they are aviary birds which is a completely different story from a handfed companion parrot. They can be tamed and they can be taught to eat a good, varied diet but it takes time, persistence and consistency as well as planning so work on getting a daily routine where they eat their breakfast early in the am and their dinner when the sun is setting and, in the morning, after they eat, spend time in the same room with them, talking, singing, whistling and give them a treat every now and then from your fingers but, if they don't take it, just leave it in a place they can reach because these are not 'rewards', they are 'friendship tokens'. Thanks for the advice so far folks but if you can help clarify something that'd be awesome. Pajarita you say that I shouldn't free feed them grains because they will be hormonal and bite (which is what is happening). At the same time though I can't deprive them of food either which makes complete sense (I wouldn't be very agreeable if I was constantly hungry either). My issue however is that if I put some fruit or veggies together with the grains/seeds they will ignore it and only eat the grains/seeds so it's a bit of a catch 22. So my question then becomes do i remove the grains/seeds overnight so they can eat the fruit in the morning? What is the best way to encourage a better diet so that they are not constantly hormonal? Most say to remove the seed when they go to sleep. My Rainbow gets hungry and will get up and eat even though it is dark. I always leave food for him. I give fruit and veg as well as cooked grains. I don't mix them the grains stand alone and the other is cut their size. I do not take this away when I give evening seed. They will go back and forth between seed and their fruit and veg. Most humans trained by parrots have learned to eat better because they eat with their parrot. Eating together is a flock thing and is still needed when the flock is small. Feeding babies is different than feeding adults because they need more food and richer in protein. If your birds are babies, give them two kinds of soft food served warm and fresh twice a day as well as a bowl with some budgie seed [it's made with grass seeds and they are pretty soft], a leafy green and a piece of fruit. What we call soft food is just food that is soft, warm and easily digestible. Gloop -which is what I feed all my birds for breakfast and all day picking- qualifies but you can also give them polenta, couscous, Irish Oatmeal, pastina, red rice, quinoa etc cooked and mixed with baby food from a jar [like sweet potato, squash, etc - no spinach]. Once they are older [after their juvenile molt] you can start an adult bird diet where you take the protein food out of the cage once they fall asleep but, for now, they need to eat as much as they want -this method is called 'abundance weaning' and it's recommended to avoid eating disorders when the bird is an adult. Thanks again for the replies. They're roughly 3 or 4 months old at the moment so they're not babies but I'm not sure I'd be calling them adults either. From what I have been able to find out if I remove the seeds for a couple of hours or so they'll be more likey to approach my hand of their own accord when I offer them food. Then once they can see they are able to see that a human hand is not something to fear they will be able to be easier trained to "step up"
Your birds might not look like babies but they are. They will have their juvenile molt at around 6 to 8 month old, when they become juveniles [they become adult when they are sexually mature]. Making a bird hungry so it accepts us is not the right thing to do -it belongs to a type of taming technique called 'flooding' and it's not longer recommended as a taming tool because it backfires in the long run [parrots are very smart and they figure out that you are not to be trusted because you are forcing them to accept something they did not want to - and they remember!]. Making a baby hungry is cruel and completely unnecessary. They need soft food in their cage all the time but you can use seed to tempt them to your hand [a bit of a millet spray will do the trick]. Be VERY careful what you do these first few months because they are the very foundation of your entire future relationship with your birds - which remind me of something that I did not mention before: do you know the gender of these birds? Because you can have a male and a female or two males living together but you can't have two females - did you know that? No I didn't know that you can't have 2 females together but that's not a concern as they are Male & Female. I did manage to coax them onto a stick/perch yesterday and then onto my hand temporarily without removing their food so it seems I may be making some progress. OK Here's the latest update: They are now mostly comfortable eating from my hand so I will continue to do this. I'm guessing that slowly but surely they will become more & more comfortable with my (and most other peoples) presence and that I will eventually be able to get them to step onto my hand without using an enticement. Getting them to step onto a stick however was unsuccessful today but again I'm guessing that it is just a matter of time before they get comfortable enough with my presence for them to do that again. If you mix a tiny bit of seeds with cooked whole grains and remove the seed bowl for the morning feeding, they will go for it without a problem.